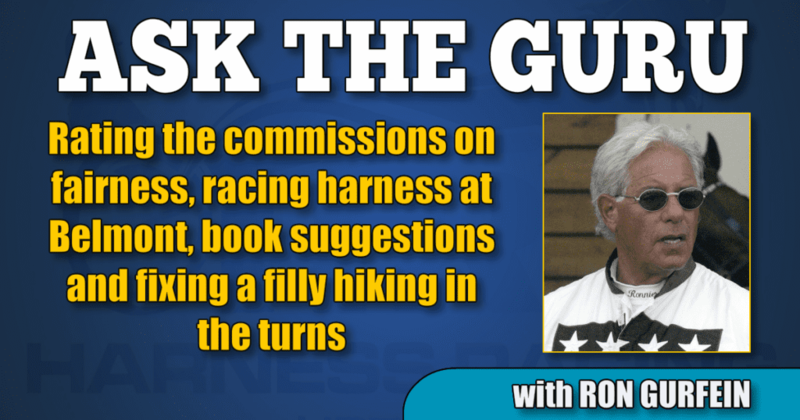 All in the latest edition of harness racing’s most popular advice column. Tidbits: The Super Bowl was a dull affair to say the least. I will add that it is certainly possible that my music desires lie in the past, but if I didn’t have captions on my television for the halftime show I would have had no idea what the performers were singing. With the captions I realized that the words were basically meaningless. It reminds me of the early days of rock and roll where they would ask a kid to rate a song and the answer invariably included, “I liked the beat.” My daughter, her husband and my grandson live in Boston so I was happy with the result of the game. There was one huge redeeming quality to the show however, to coin a phrase “a star was born.” Tony Romo is, in my opinion, the best first-year sportscaster I have ever had the pleasure of listening to. Aside from being so knowledgeable as to predict coaches’ decisions, he was also very quick with his analysis of the play on the field. In actuality, he created a special interest in a rather dull football event. There are rumors of his return to the field. Hopefully the CBS front office is smart enough not to let this broadcasting gem slip away. It is widely speculated that the Patriots work ethic is beyond belief. I think that is true of any business. Harness racing is no different than football. The harder you work the more successful you become. But only true if you add IQ to the equation. I never met a major trainer that didn’t work hard or have a good head. This is especially true today with all the modern technology surfacing in the equine industry. From the 1900s through the end of the century very little changed as far as training and technology, but when the 21st century arrived, all hell broke loose. That is why our horses are going faster than our thoroughbred counterparts who are going the same speed as they did 100 years ago. They don’t have bikes, hitches, hubrails etc. Congratulations to all the O’Brien winners. Special words for my friend Tony Alagna and his partners for Tall Drink Hanover and to Casie Coleman and McWicked, without question one of the most overpowering aged horses I have seen in my six decades of watching horses. How about our Wildcats, now number five in the AP Poll and on a nine-game winning streak? The Duke blowout and the Seton Hall loss are behind us, now the Big Blue Nation is rolling to a rematch with the Dukies some time in late March. They have two giant games left and maybe three against number one Tennessee. Two on the schedule and a likely meeting in the SEC tourney. Cowboy Mike from Queens New York asks: How would Yonkers at Belmont work out and isn’t it a bad sign that MGM dropped the Sunday races that were exported to France. It is a physical impossibility to race standardbreds and thoroughbreds on the same track. I did witness this at the Pomona State Fair in California, but that was fair racing for one day. On an every day basis, it doesn’t work. The track as it is now would be way too deep for our horses. In answer to you question, they would have to build a harness track inside their existing one. I personally think it’s an awful idea for live audiences. It reminds me of the similar situation at Woodbine in Toronto, where the harness oval was inside the thoroughbred track, to me the worst visual experience in all of harness racing. You were so far from the horses you needed binoculars to watch the races. As far as MGM is concerned, they didn’t cancel the Sunday cards, French racing has fallen on hard times due to the economy’s slowing and the powers that be wanted to stop the flow of cash to foreign interests. The French elected to stop the simulcasting. Their harness racing decisions have always blown with the wind so don’t be dismayed. There is always a good chance the situation will reverse itself. Alice Dearborn asks: I enjoy you column but I miss your book suggestions. Can you make some new suggestions? Alice, as you know, I am an avid reader and usually read at least one book a week. In the last six months or 26 weeks I haven’t read half that many and found most very disappointing. I am in an author rut as are many avid readers. I love certain authors and when I have finished with them, then I have time to research others. My favorites have done nothing but disappoint in recent months. I find that even though their offerings remain on the New York Times Best Seller List they weren’t worth reading. John Grisham, David Baldacci, and Michael Connelly have all had a best seller recently that were not the type off offering that I would recommend to anyone. The latest Lee Child book, Past Tense a Jack Reacher novel, was definitely worth reading. I did suggest a few weeks ago Where the Crawdads Sing a first novel by Delia Owens. I loved this book and it has been on the NYT list for 20 weeks and has risen back to number one as I write this, a very unusual occurrence. There is an author I go to when I feel I must have a new book and until now have never been disappointed. If you like European war time stories Philip Kerr writes about an ex Berlin homicide detective who, because of his refusal to join the Nazi party, is released from the force to become a Hotel cop in the famous Adlon Hotel. The character is fabulous and the writer is wonderful. There are at least 10 or more novels in this series and every one I selected (about six so far) has been a page-turner. My favorite was The Lady From Zagreb. In my opinion, all jurisdictions are effective and fair. I hate to be so vanilla, but it’s true. There are bad apples in every bunch. What happened in Pennsylvania with the disappearing positives is horrible, but they say it was human error and I buy it. The lack of transparency in the time allotted by the Alcohol and Gaming Commission of Ontario in the Zeron matter I find deplorable. I made a promise I would not talk about the case until more information becomes available and I am going to stick to that decision. I thankfully have not had a particularly lurid past so my personal experiences with racing commissions have been pleasant for the most part. Never in my lifetime have I raced for any judge that I would have said there was any reason he shouldn’t be in the stand. On the other hand, there were many who I admired and thought were quite reasonable and proper. Vincent Bergamo, who was the PJ at Monticello was a wonderful man. I have recently been corrected on this, but I always thought it was impossible to win appeals in New Jersey or maybe it was just when I was a kid. I remember losing an appeal when to this day I am 100000000 per cent right and everyone except the judges agreed. I had a horse that was second under the wire in a major stake at the Meadowlands and John Campbell was on a 2-5 favorite that broke stride and ran the entire length of the stretch beating my horse by a neck on the wire and was not disqualified. If it was Yonkers they would have burned the track down. PS I lost the appeal. In those days the commission never overturned the commission. Today they go to civil court, totally different story. Richard Parsons from New Zealand asks: I am in your hands “Guru.” I asked your help last year and it worked well please help me out again. I have a nice trotting filly that trots the straights perfectly but gets to hiking terribly in the turns I blocked her hocks and hind ankles with no success at all what do I do to fix her? I am 99 per cent sure I can go two for two with you. It is very unusual for a trotter to hike in the turns because of hind-end lameness. In my experience, nine times out of 10 she is sore in her right knee. Next, but highly unlikely, I would say right front ankle, then right front foot and last about a 1,000-1 shot inside left front foot. Your problem is the most common problem in standardbreds. No trainer has ever had a stable that didn’t have to figure this out in history. John Campbell when he started racing at the Meadowlands (a mile track), would get off a horse like your filly that was running in badly on the turns and would jokingly say, “I think he needs a bigger track.” Billy O’Donnell drove a horse for me that was always off in his right knee and if I neglected it for too long he would get off the horse and say “Ronnie, I have no idea what he was doing in the last turn but he was doing it very fast.” There are a bunch of esoteric things that could be causing your problem but I would rate them highly unlikely. However, if for some reason I am wrong and you need more help I can get a little fancy when I have to. Thanks to all of you for the kind words I receive each week via email. Please don’t think I am slacking on the events unfolding now. There is too much speculation and basically unfounded controversy on some of these newsworthy stories. Unfortunately I have received a lot of innuendo and no real hard facts. Be assured that as soon as I get the proper information you will have the entire story. Have s wonderful week and if you are in south Florida come visit Frank and Dino’s. You will find me there at least three times a week. Although the clientele is mostly thoroughbred they still welcome harness people with open arms.